① Preheat the oven at 180C(350F). In a bowl, whisk flour, sugar, baking powder and salt. ② Mix milk, eggs and vanilla extract. Whisk im the dry ingredients. ③ Heat butter in the microwave for 10-20 seconds to soften (not to melt completely). Whisk in ②. ④ Line 12 cupcake moulds. Divide the batter into 12 cups. Bake for 20 minutes. They are ready if wet batter does not stick to an inserted skewer. ⑤ Take out the oven. Leave for 10 minutes. Unmould and cool on a rack. 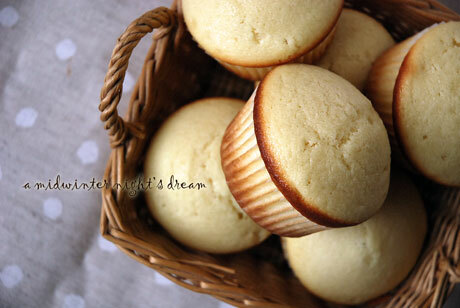 ◆　If you are icing your cupcakes, it is recommended to use half the recipe and bake about 8 cupcakes.